We see here the importance placed on the unusually nutritious and easily digested and utilized raw food from the Creator for His us His beloved. 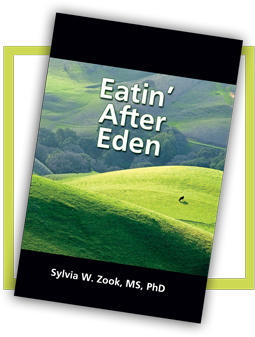 Goat milk was a nutrient-dense food enjoyed in the New Testament as well. (See 1 Corinthians 9:7.) Many people who cannot tolerate pasteurized cow milk can drink this easily-digested, naturally homogenized, creamy "nectar." 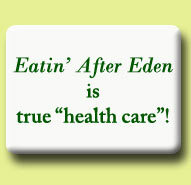 You will find a great deal about raw goat milk in Eatin' After Eden. For years we have been blessed to know a couple with a local Nubian goat dairy. These amazing animals give incredibly 7% fat rich, nutritious milk, and help produce remarkable health in the face of the worst. In Goat Milk Magic Dr. Bernard Jensen, who thrived into his nineties, wrote about his highly successful sanitarium and clinic using almost exclusively this great support of healing for many health issues. We lost our friend Richard after he had survived metastatic cancer for about 14 years subsequent to its being diagnosed "terminal" and he was sent home to die. His strength came from drinking the highly nutritious, raw milk, he and Helen, his wife, testified. Not until the cancer metastasized from the prostate did he undergo chemo. The highly toxic chemicals seemed to weaken him more than help, they thought. Yet he kept plugging away and we would see him often working around the place. When I saw him just before he died he was out at the barn chatting with some friends. Again as always, I was utterly amazed he was still alive, much less walking out to the barn quite a distance from the house, and helping Helen with the goats for some time. Throughout all of this, Helen, though not a young woman, has been very strong, taking care of her husband and doing the milking of many goats. Sometimes we would go to pick up milk about 9:30 p.m. and she would be sitting milking with her cat on her lap. (Our cat Seeka loved this treat, and would not drink pasteurized milk.) So many depended upon this great service to the community's "pets" (raw milk for humans is of course not legal except in California at this time). I spoke with Helen a week after Richard’s death. She said, "This is bad. Really bad. But God will not give us a cross we cannot bear." I said, "His cross hurt Him. And we can weep when ours do as well." She replied, "Yes. It will take me some time but I will get through this." I said, 'Yes, you will." I went to see her again soon afterwards and took her a beautiful bouquet, and mostly listened, in love.